As a regular visitor to the East Lancashire Railway over the last ten years or so, I’ve got to know many of the best locations for lineside photography. Regular readers will be aware of my tendency to look for something beyond the standard ‘train in station’ photographs, and as quite a lot of the lineside is accessible, I thought I’d share some locations. This guide is somewhat incomplete as it only has one location on the Bury to Heywood stretch, but this section of line is somewhat uninteresting from a photographic perspective, and the location I’ve listed is the only I’ve visited, unlike the rest of the line. I will also be covering a couple of places that are not accessible without permission. While I don’t always bother with permission for my urbex photography, I always do with my railway photography. As an introduction to the line, it’s one of the few heritage lines in the northwest of england, and by far the longest, in fact it’s one of the longer heritage lines in the country. It runs through a diverse landscape – through a town centres, suburbs and the countryside. The main station, Bury, is a large station and once functioned as the towns main station, and remains substantially as it was in British Rail days, as does the station at Ramsbottom, although much reduced from it’s heyday. Rawtenstall is a new station, albeit built in a traditional way, and is a terminus at the northern end of the line, as further progress is blocked by modern developments. Although the line has little real prospect of adding any more miles of track (although an extension to Castleton has been mooted), future developments are likely to be at the railways Buckley Wells sheds, and possibly around the Heywood station. The line is on an incline more or less all the way from Bury to Rawtenstall, so if you want to see an engine working (relatively) hard, then you will want to see it heading north up the line from Bury, as it’s downhill all the way back. Working hard is a relative concept of course, with a speed limit of 25 mph like all heritage lines, larger engines aren’t exactly taxed on this line when hauling only 8 coaches or so. Still, unless it’s the summer, you will see a nice head of steam when setting off from stations and up some of the gradients. One thing I am often conscious of is backgrounds, and I’ve chosen a lot of these spots because of the backgrounds and or foregrounds. The line is very much British Rail themed, and is home to both steam and diesels. I have no personal interest in diesel traction, and all the photographs in this series will feature steam, but the locations are fine for both types of traction. I can’t see where the guide can be read. Where do I find the guide please? I am interested because I would like to do some train shots this weekend and see if I can improve on those I got at the KWVR last weekend. This is the first of a series of blog posts – I’m still writing the rest! I’ll send you an email before the weekend when I get on my main computer where the articles currently reside. 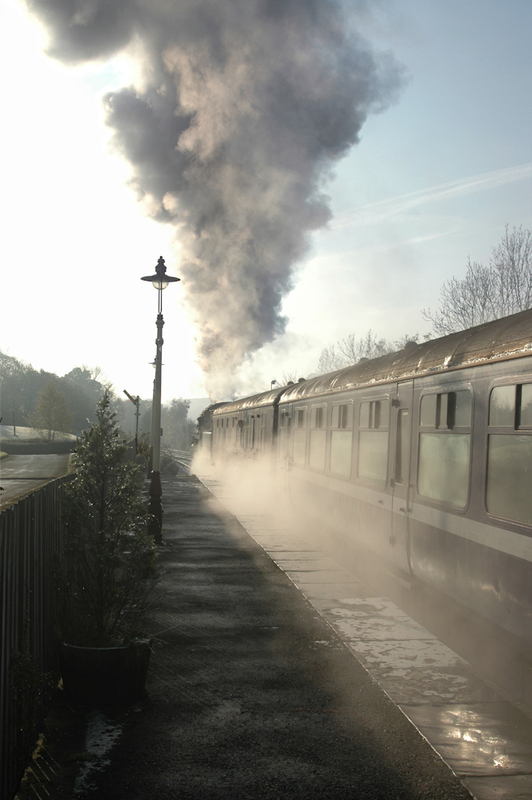 East Lancashire Railway seems to offer a great many photo opportunities. I love those old steam trains. The photograph is delightful being backlit and with the dynamic steam puffing into the sky. I also like the limited colour range. Any update on when locations will appear ? Posts 276 -287 are all locations. Thanks Nigel, sounds like an interesting venture!